This is a follow up question to group list-of-todos by chapter. egreg's solution works great with classicthesis and scrreprt, and I've been trying to do the same without classicthesis and for scrartcl, i.e. add group the list of todos by section. The code below is directly based on egreg's code and almost works, although it always adds the title of the last section as well, even when there is no todonote. So this is the first thing I need help fixing, and secondly there is probably an easier way to do this rather than using code based on classicthesis. I'm not wed to tocloft, but I quite like it for customisations (which are not in this MWE). This is basically an adaptation of my answer to Include chapters in List of Figures with titletoc? 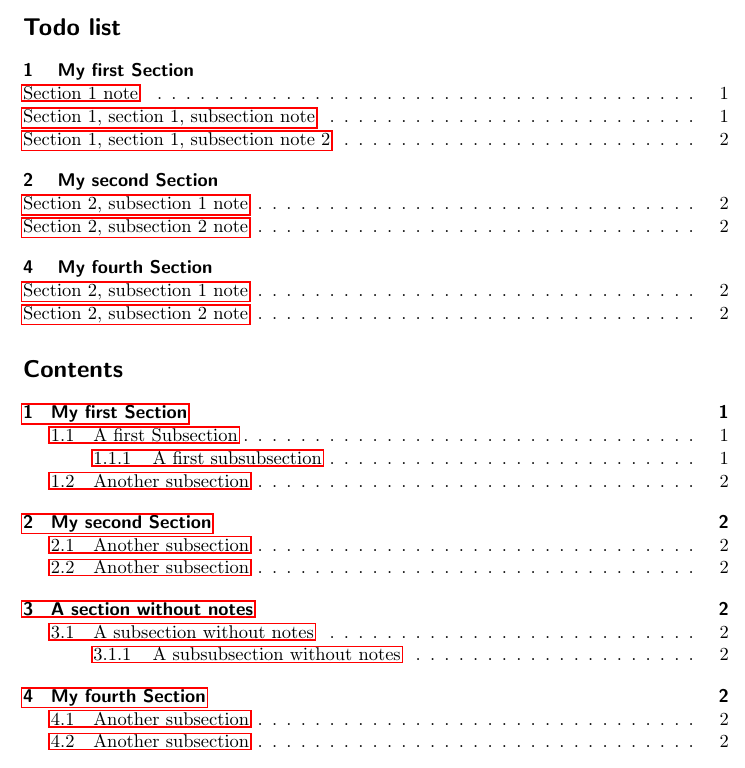 The \todo command does the job and decide if the section info will be written to the List of Todos; whenever the \todo command is used in the document, it will examine a boolean flag; if the boolean is false, then it adds the section information to the List of Todos and sets the boolean to true; otherwise, it does not add any information. The \section command was also modified to reset the boolean. \@sect was modified to globally store the information about the corresponding title and number for the section; this information will then be used when writing to the List of Todos. Not the answer you're looking for? Browse other questions tagged table-of-contents tocloft todonotes or ask your own question. todonotes: how to hide certain entries from list of todos?